Often buying a whole chicken at the grocery store is great way to save some money. However, buying a whole chicken can be a bit intimidating if you have never cooked one. If you want to buy a whole chicken at the grocery store but your not sure what to do with it we have the perfect solution. Make a slow cooker rotisserie chicken! 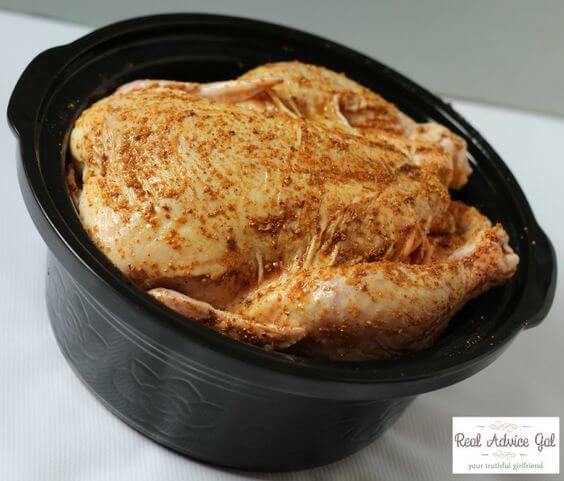 Rotisserie Chicken cooked in the crock pot is perfect for multiple meals! Cook the chicken for one meal and use the leftovers for Chicken Pot Pie, Chicken Pizza, Chicken Salad and more! A great way to plan meals during the week. Prep time should be about 20 minutes and will cook for six hours on low. 1. Make 4 foil balls. Place in the bottom of the slow cooker. 3. Place chicken on top of the foil balls. You don’t want the chicken to touch the bottom of the slow cooker. Cover chicken with aluminum foil. 4. Cook for 3 hours on high or 6 hours on low until the internal temperature reaches 185ºF. That’s it! Simple, right? The best part is that our family of 4 can’t eat an entire chicken so there are always plenty of leftovers. You can make so many dishes with leftover rotisserie chicken. Everything from chicken salad, pasta dishes, and casseroles.